Abkhazia (Abkhaz: Аҧсны́ Apsny [apʰsˈnɨ]; Georgian: აფხაზეთი Apkhazeti [ɑpʰxɑzɛtʰi]; Russian: Абха́зия, Abkhа́ziya; [ɐpˈxazʲɪjə]) is a partially recognised state on the eastern coast of the Black Sea and the south-western flank of the Caucasus Mountains, south of Russia and northwest of Georgia proper. It covers 8,660 square kilometres (3,340 sq mi) and has a population of around 240,000. Its capital is Sukhumi. The separatist Abkhazian polity, formally the Republic of Abkhazia or Apsny, is recognised only by Russia and a small number of other countries. While Georgia lacks control over Abkhazia, the Georgian government, the United Nations and the majority of the world's governments consider Abkhazia part of Georgia, whose constitution designates the area as the Autonomous Republic of Abkhazia. The status of Abkhazia is a central issue of the Georgian–Abkhazian conflict and Georgia–Russia relations. The region enjoyed autonomy within Soviet Georgia at the time when the Soviet Union began to disintegrate in the late 1980s. Simmering ethnic tensions between the Abkhaz—the region's "titular ethnicity"—and Georgians—the largest single ethnic group at that time—culminated in the 1992–1993 War in Abkhazia which resulted in Georgia's loss of control of most of Abkhazia, the de facto independence of Abkhazia, and the mass exodus and ethnic cleansing of Georgians from Abkhazia. Despite the 1994 ceasefire agreement and years of negotiations, the dispute remains unresolved. The long-term presence of a United Nations Observer Mission and a Russian-led Commonwealth of Independent States (CIS) peacekeeping force failed to prevent the flare-up of violence on several occasions. In August 2008, Abkhaz forces fought against Georgian forces during the Russo-Georgian War, which led to the formal recognition of Abkhazia by Russia, the annulment of the 1994 ceasefire agreement, and the termination of the UN mission. On 28 August 2008, the Parliament of Georgia declared Abkhazia a Russian-occupied territory. The Russian Абхазия (Abkhazia) is adapted from the Georgian აფხაზეთი (Apkhazeti). In Mingrelian, Abkhazia is known as აბჟუა (Abzhua) or სააფხაზო (saapkhazo). Abkhazia's names in Western languages derived directly from the Russian form: Abkhazie in French; Abkhazien in Danish; Abchasien in German; Abcházie in Czech; Abchazië in Dutch; Abcasia in Italian; Abjasia in Spanish; and Abcázia in Portuguese. Between the 9th and 6th centuries BC, the territory of modern Abkhazia was part of the ancient Georgian kingdom of Colchis (Kolkha). This kingdom was subsequently absorbed in 63 BC into the Kingdom of Egrisi, known to Byzantine Roman sources as Lazica. Between 1000 and 550 BC, the Greeks established trade colonies along the Black Sea coast of present-day Abkhazia, in particular at Pitiunt and Dioscurias, which was to become the capital of modern-day Abkhazia, encountering local warlike tribes whom they dubbed Heniochi. Classical authors described various peoples living in the region and the great multitude of languages they spoke. Arrian, Pliny and Strabo have given accounts of the Abasgoi (generally considered ancestors of the modern Abkhazians) and Moschoi (generally considered as ancestors of Georgian Meskhetians) peoples somewhere in modern Abkhazia on the eastern shore of the Black Sea. The Roman Empire conquered Egrisi in the 1st century AD and ruled it until the 4th century, following which it regained a measure of independence, but remained within the Byzantine Empire's sphere of influence. Although the exact time when the population of the region of Abkhazia was converted to Christianity has not been determined, it is known that the Metropolitan of Pityus participated in the First Ecumenical Council in 325 in Nicaea. Around the mid 6th century AD, the Byzantines and the neighbouring Sassanid Persia fought for supremacy over Abkhazia for 20 years, a conflict known as the Lazic War. Abkhazia, or Abasgia in classic sources, formerly part of Colchis and later of Egrisi (Lazica) until the late 690s, was a princedom under Byzantine authority. Anacopia was the princedom's capital. The country was mostly Christian, with the archbishop's seat in Pityus. An Arab incursion into Abkhazia led by Marwan II, was repelled by Leon I jointly with his Egrisian and Kartlian allies in 736. In the 16th century, after the break-up of the Georgian Kingdom into small kingdoms and principalities, Principality of Abkhazia (nominally a vassal of the Kingdom of Imereti) emerged, ruled by the Shervashidze dynasty (also known as Sharvashidze, or Chachba). Since the 1570s, when the Ottoman navy occupied the fort of Tskhumi, Abkhazia came under the influence of the Ottoman Empire and Islam. Under Ottoman rule, the majority of Abkhaz elite converted to Islam. The principality retained a degree of autonomy. Georgia signed a treaty with Russia for protection against the Ottoman Empire in 1773 and was seemingly absorbed, while Abkhazia sought protection from Russia in 1801, but was declared as "an autonomous principality" by the Russians in 1810. Russia then annexed Abkhazia in 1864, and Abkhaz resistance was quashed as the Russians deported Muslim Abkhaz to Ottoman territories. By official decision of the Russian authorities the residents of Abkhazia and Samurzakano had to study and pray in Russian. After the mass deportation of 1878, Abkhazians were left in the minority, officially branded "guilty people", and had no leader capable of mounting serious opposition to Russification. On 17 March 1898 the synodal department of the Russian Orthodox Church of Georgia-Imereti, by order 2771, again prohibited teaching and the conduct of religious services in church schools and churches of the Sukhumi district in Georgian. Mass protests by the Georgian population of Abkhazia and Samurzakano followed, news of which reached the Russian emperor. On 3 September 1898 the Holy Synod issued order 4880 which decreed that those parishes where the congregation was Mingrelians i.e. Georgians, conduct both church services and church education in Georgian, while Abkhazian parishes use old Slavic. In the Sukhumi district, this order was carried out in only three of 42 parishes. Tedo Sakhokia demanded the Russian authorities introduce Abkhazian and Georgian languages in church services and education. The official response a criminal case brought against Tedo Sakhokia and leaders of his "Georgian Party" active in Abkhazia. In 1921, the Bolshevik Red Army invaded Georgia and ended its short-lived independence. Abkhazia was made a Socialist Soviet Republic (SSR Abkhazia) with the ambiguous status of a treaty republic associated with the Georgian SSR. In 1931, Joseph Stalin made it an autonomous republic (Abkhaz Autonomous Soviet Socialist Republic or in short Abkhaz ASSR) within the Georgian SSR. Despite its nominal autonomy, it was subjected to strong direct rule from central Soviet authorities. Under the rule of Stalin and Beria Abkhaz schools were closed, requiring Abkhaz children to study in the Georgian language. The publishing of materials in Abkhazians dwindled and was eventually stopped altogether; Abkhazian schools were closed on 1945/46. In the terror of 1937-38, the ruling elite was purged of Abkhaz and by 1952 over 80% of the 228 top party and government officials and enterprise managers were ethnic Georgians; there remained 34 Abkhaz, 7 Russians and 3 Armenians in these positions. Georgian Communist Party leader Candide Charkviani supported the Georgianization of Abkhazia. As the Soviet Union began to disintegrate at the end of the 1980s, ethnic tensions grew between the Abkhaz and Georgians over Georgia's moves towards independence. Many Abkhaz opposed this, fearing that an independent Georgia would lead to the elimination of their autonomy, and argued instead for the establishment of Abkhazia as a separate Soviet republic in its own right. In June 1988, a manifesto defending Abkhaz distinctiveness (known as the Abkhaz Letter) was sent to Soviet leader Mikhail Gorbachev. In March 1990, Georgia declared sovereignty, unilaterally nullifying treaties concluded by the Soviet government since 1921 and thereby moving closer to independence. The Republic of Georgia boycotted the 17 March 1991 all-Union referendum on the renewal of the Soviet Union called by Gorbachev; however, 52.3% of Abkhazia's population (almost all of the ethnic non-Georgian population) took part in the referendum and voted by an overwhelming majority (98.6%) to preserve the Union. Most ethnic non-Georgians in Abkhazia later boycotted a 31 March referendum on Georgia’s independence, which was supported by a huge majority of Georgia's population. Within weeks, Georgia declared independence on 9 April 1991, under former Soviet dissident Zviad Gamsakhurdia. Under Gamsakhurdia, the situation was relatively calm in Abkhazia and a power-sharing agreement was soon reached between the Abkhaz and Georgian factions, granting to the Abkhaz a certain over-representation in the local legislature. On 21 February 1992, Georgia's ruling Military Council announced that it was abolishing the Soviet-era constitution and restoring the 1921 Constitution of the Democratic Republic of Georgia. Many Abkhaz interpreted this as an abolition of their autonomous status, although the 1921 constitution contained a provision for the region's autonomy. On 23 July 1992, the Abkhaz faction in the republic's Supreme Council declared effective independence from Georgia, although the session was boycotted by ethnic Georgian deputies and the gesture went unrecognised by any other country. The Abkhaz leadership launched a campaign of ousting Georgian officials from their offices, a process which was accompanied by violence. In the meantime, the Abkhaz leader Vladislav Ardzinba intensified his ties with hardline Russian politicians and military elite and declared he was ready for a war with Georgia. In August 1992, the Georgian government accused Gamsakhurdia's supporters of kidnapping Georgia's Interior Minister and holding him captive in Abkhazia. The Georgian government dispatched 3,000 soldiers to the region, ostensibly to restore order. The Abkhaz were relatively unarmed at this time and the Georgian troops were able to march into Sukhumi with relatively little resistance and subsequently engaged in ethnically based pillage, looting, assault, and murder. The Abkhaz units were forced to retreat to Gudauta and Tkvarcheli. Prior to the 1992 War, Georgians made up nearly half of Abkhazia's population, while less than one-fifth of the population was Abkhaz. As the war progressed, confronted with hundreds of thousands of ethnic Georgians who were unwilling to leave their homes, the Abkhaz separatists implemented the process of ethnic cleansing in order to expel and eliminate the Georgian ethnic population in Abkhazia. The exact number of those killed during the ethnic cleansing is disputed, however, it ranges from 8,000 to 10,000 people, not including the civilians who were killed in 1998 during the separatist onslaught on Gali region. Roughly up to 250,000 ethnic Georgians were expelled from their homes. Slightly over 200,000 Georgians remain displaced in Georgia proper. The campaign ethnic cleansing also included Russians, Armenians, Greeks, moderate Abkhaz and other minor ethnic groups living in Abkhazia. More than 20,000 houses owned by ethnic Georgians were destroyed. Hundreds of Schools, kindergartens, churches, hospitals, historical monuments were pillaged and destroyed. Following a process of ethnic cleansing and mass expulsion, the population of Abkhazia has been reduced to 216,000, from 525,000 in 1989. Presidential elections were held in Abkhazia on 3 October 2004. Russia supported Raul Khadjimba, the prime minister backed by the ailing outgoing separatist President Vladislav Ardzinba. Posters of Russia's President Vladimir Putin together with Khadjimba, who, like Putin, had worked as a KGB official, were everywhere in Sukhumi. Deputies of Russia's parliament and Russian singers, led by Joseph Cobsohn, a State Duma deputy and a popular singer, came to Abkhazia, campaigning for Khadjimba. − However Raul Khadjimba lost the elections to Sergei Bagapsh. The tense situation in the republic led to the cancellation of the election results by the Supreme Court. After that, a deal was struck between former rivals to run jointly, with Bagapsh as a presidential candidate and Khadjimba as a vice presidential candidate. They received more than 90% of the votes in the new election. On 9 August 2008, Abkhazian forces fired on Georgian forces in Kodori Gorge. This coincided with the 2008 South Ossetia war where Russia decided to support the Ossetian separatists who had been attacked by Georgia. The conflict escalated into a full-scale war between the Russian Federation and the Republic of Georgia. On 10 August 2008 an estimated 9,000 Russian soldiers entered Abkhazia ostensibly to reinforce the Russian peacekeepers in the republic. About 1,000 Abkhazian soldiers moved to expel the residual Georgian forces within Abkhazia in the Upper Kodori Gorge. By 12 August the Georgian forces and civilians had evacuated the last part of Abkhazia under Georgian government control. Russia recognised the independence of Abkhazia on 26 August 2008. This was followed by the annulment of the 1994 ceasefire agreement and the termination of UN and OSCE monitoring missions. On 28 August 2008 the Parliament of Georgia passed a resolution declaring Abkhazia a Russian-occupied territory. Abkhazia, Transnistria, Nagorno-Karabakh, and South Ossetia are post-Soviet "frozen conflict" zones. These four states maintain friendly relations with each other and form the Community for Democracy and Rights of Nations. Russia and Nicaragua officially recognised Abkhazia after the Russo-Georgian War. Venezuela recognised Abkhazia in September 2009. In December 2009, Nauru recognised Abkhazia, reportedly in return for $50 million in humanitarian aid from Russia. The unrecognised republic of Transnistria and the partially recognised republic of South Ossetia have recognised Abkhazia since 2006. Abkhazia is also a member of the Unrepresented Nations and Peoples Organization (UNPO). On 3 July 2008, the OSCE Parliamentary Assembly passed a resolution at its annual session in Astana, expressing concern over Russia’s recent moves in breakaway Abkhazia. The resolution calls on the Russian authorities to refrain from maintaining ties with the breakaway regions "in any manner that would constitute a challenge to the sovereignty of Georgia" and also urges Russia "to abide by OSCE standards and generally accepted international norms with respect to the threat or use of force to resolve conflicts in relations with other participating States." On 9 July 2012, the OSCE Parliamentary Assembly passed a resolution at its annual session in Monaco, underlining Georgia’s territorial integrity and referring to breakaway Abkhazia and South Ossetia as "occupied territories". The resolution "urges the Government and the Parliament of the Russian Federation, as well as the de facto authorities of Abkhazia, Georgia and South Ossetia, Georgia, to allow the European Union Monitoring Mission unimpeded access to the occupied territories." It also says that the OSCE Parliamentary Assembly is "concerned about the humanitarian situation of the displaced persons both in Georgia and in the occupied territories of Abkhazia, Georgia and South Ossetia, Georgia, as well as the denial of the right of return to their places of living." The Assembly is the parliamentary dimension of the OSCE with 320 lawmakers from the organisation’s 57 participating states, including Russia. According to Georgian officials, the "neutral passports" lacked any symbols of Georgia and only bore a registration number and an individual number. Moscow argued it was Georgia’s "cunning ploy" because the passports contained Georgia’s code and the Georgian Interior Ministry as the issuing body. Abkhazia’s Foreign Ministry expressed concerns about some countries recognising the "neutral passports." The ministry also said an increasing number of Abkhazian residents with Russian passports were being denied Schengen visas. The world's deepest known cave, Krubera (Voronja) Cave ("The Crows' Cave"), is located in Abkhazia's western Caucasus mountains. The latest survey (as of September 2006) has measured the vertical extent of this cave system as 2,158 meters (7,080 ft) between its highest and lowest explored points. 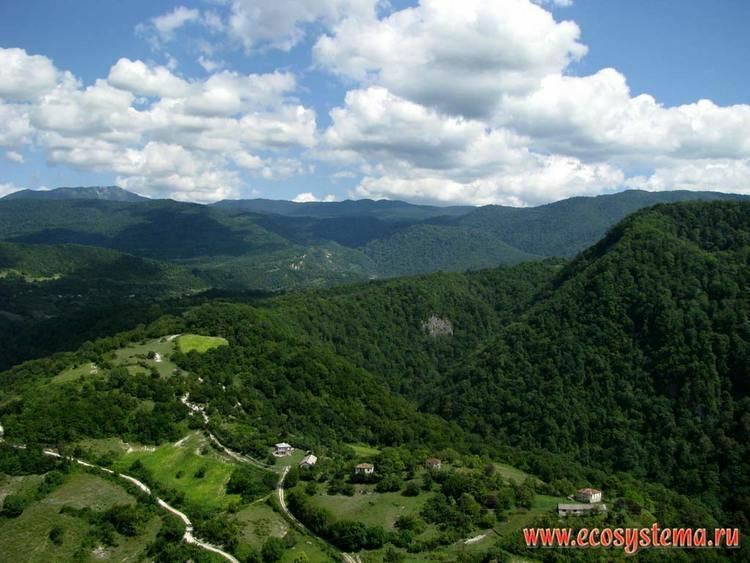 Because of Abkhazia's proximity to the Black Sea and the shield of the Caucasus Mountains, the region's climate is very mild. The coastal areas of the republic have a subtropical climate, where the average annual temperature in most regions is around 15 °C (59 °F), and the average January temperature remains above freezing. The climate at higher elevations varies from maritime mountainous to cold and summerless. Also, due to its position on the windward slopes of the Caucasus, Abkhazia receives high amounts of precipitation, though humidity decreases further inland. The annual precipitation vacillates from 1,200–1,400 mm (47.2–55.1 in) along the coast 1,700–3,500 mm (66.9–137.8 in) in the higher mountainous areas. The mountains of Abkhazia receive significant amounts of snow. During the War in Abkhazia, the Government of the Autonomous Republic of Abkhazia (at the time the Georgian faction of the "Council of Ministers of Abkhazia") left Abkhazia after the Abkhaz separatist forces took control of the region’s capital Sukhumi and relocated to Georgia’s capital Tbilisi where it operated as the Government of Abkhazia in exile for almost 13 years. During this period, the Government of Abkhazia in exile, led by Tamaz Nadareishvili, was known for a hard-line stance towards the Abkhaz problem and frequently voiced their opinion that the solution to the conflict can be attained only through Georgia's military response to secessionism. Later, Nadareishvili's administration was implicated in some internal controversies and had not taken an active part in the politics of Abkhazia until a new chairman, Irakli Alasania, was appointed by President of Georgia, Mikheil Saakashvili, his envoy in the peace talks over Abkhazia. The Abkhazian Armed Forces are the military of the Republic of Abkhazia. The basis of the Abkhazian armed forces was formed by the ethnically Abkhaz National Guard formed early in 1992. Most of the weapons come from the former Russian airborne division base in Gudauta. The Abkhazian military is primarily a ground force but includes small sea and air units. Russia has at present around 1,600 troops stationed in Abkhazia. Most inhabitants of Abkhazia are Christian (Eastern Orthodox and Armenian Apostolic), Sunni Muslim or irreligious, but few people who declare themselves Christian or Muslim attend religious service. The Abkhaz Native Religion has undergone a strong revival in recent decades. There is a very small number of adherents of Judaism, Jehovah's Witnesses and new religious movements. The Jehovah's Witnesses organisation has officially been banned since 1995, though the decree is not currently enforced. The languages spoken in Abkhazia are Abkhaz, Russian, Mingrelian, Svan, Armenian, and Greek. The Autonomous Republic passed a law in 2007 defining the Abkhaz language as the only state language of Abkhazia. As such, Abkhaz is the required language legislative and executive council debates (with translation from and to Russian) and at least half of the text of all magazines and newspapers must be in Abkhaz. 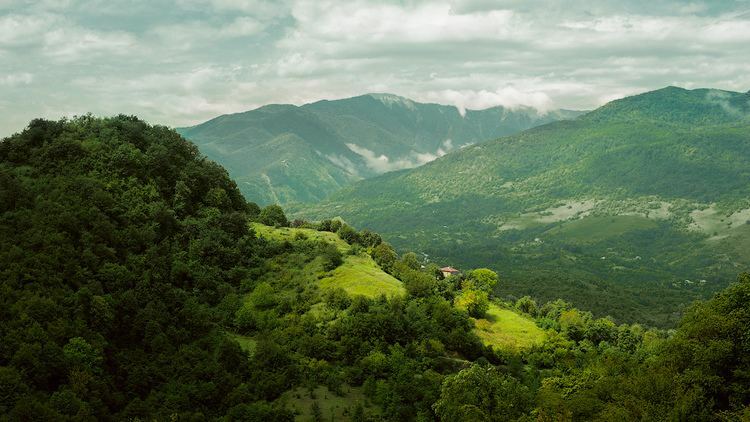 Despite the official status of Abkhaz, the dominance of other languages within Abkhazia, especially Russian, is so great that experts as recently as 2004 called it an "endangered language". During the Soviet era, language instruction would begin in schools in Abkhaz, only to switch to Russian for the majority of required schooling. The government of the Republic is attempting to institute Abkhaz-only primary education but there has been limited success sue to a lack of facilities and educational materials. Even in Georgian-speaking areas of the Republic, ending schooling in that language has resulting in teachers switching to Russian-language materials instead of Abkhaz-language teaching. Abkhazians began mass acquisition of Russian passports in 2002. It is reported that the public organisation the Congress of Russian Communities of Abkhazia started collecting Abkhazians’ Soviet-era travel documents. It then sent them to a consular department specially set up by Russian Foreign Ministry officials in the city of Sochi. After they were checked, Abkhazian applicants were granted Russian citizenship. By 25 June 2002, an estimated 150,000 people in Abkhazia had acquired the new passports, joining 50,000 who already possessed Russian citizenship. The Sukhum authorities, although officially not involved in the registration for Russian nationality process, openly encouraged it. Government officials said privately that President Putin’s administration agreed with the passport acquisition during Abkhazia’s prime minister Djergenia's visit to Moscow in May 2002. In 2005, citing the need to integrate ethnic Georgian residents of eastern districts of Abkhazia, the then-leadership of Abkhazia showed signs of a softening stance towards granting of citizenship to the residents of Gali, Ochamchire and Tkvarcheli districts. In early 2013 the process of passportisation of ethnic Georgians came under the scrutiny of Abkhaz opposition groups who turned this issue into one of the central topics of the breakaway region’s internal politics, and issuing of passports was suspended in May. Opposition claimed that "massive" passportisation involving granting citizenship to ethnic Georgians in eastern districts was fraught with risk of "losing sovereignty and territorial integrity." According to Apsnipress, Stanislav Lakoba, secretary of Abkhaz security council, said that "We are facing the process of the total Georgianization of Abkhazia." On 18 September 2013, the Parliament of Republic of Abkhazia adopted a resolution instructing the prosecutor’s office to carry out a "sweeping" probe into passport offices of the interior ministry and where wrongdoings were found in the distribution of passports to refer those violations to the Ministry of Internal Affairs for "annulment of illegally issued passports." Abkhaz officials announced that a significant number of residents of Gali, Ochamchire and Tkvarcheli districts received Abkhaz passports while at the same time retaining their Georgian citizenship, which constituted a "violation of the law on Abkhaz citizenship". According to the Abkhaz officials, more than 26,000 passports were distributed in Gali, Tkvarcheli and Ochamchire districts, including about 23,000 of which were given out since Russian recognition of Abkhazia's independence in August, 2008. These political debates have caused concerns in the ethnic Georgian population of Abkhazia, who reside mainly in Gali district, that they would be stripped of Abkhazian citizenship and thus forced to leave Abkhazia again. In October 2013 Alexander Ankvab signed a document ordering the firing Stanislav Lakoba. The document did not state any reason for the decision but Lakoba saw it as related to his political position on granting citizenship to Georgians living in Gali. Lakoba claimed that, according to data from the Abkhaz Security Council, 129 local people in Gali fought against Abkhazia. Local political parties and the coordination council of civil organisations expressed concern about Lakoba’s dismissal. They claimed that, by dismissing him, the president "made an illegal process legal" – giving Abkhazian passports to Georgian citizens. Abkhazia has had its own amateur Abkhazian football league since 1994 though it has no international football union membership. In 2016 it hosted and won the ConIFA World Football Cup.